The swallows are still around, skimming low over New Lanark Roof Garden and belly-flopping into the fountain where they catch flies and other insects on the water surface. Nearby the heads of the purple anemones waggle gently in the wind, while the crimson penstemons shine out against New Lanark’s stonework. Bees are buzzing in the heather ‘Silver Knight’ with its mass of pale lilac flowers and silvery foliage. Wonderful! 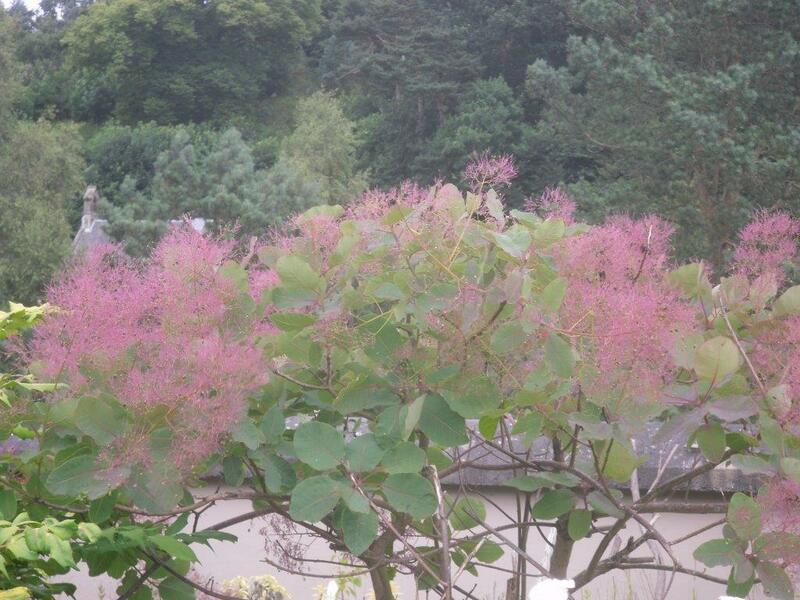 This month the Smoke Bush (Cotinus coggygria ‘Royal Purple’) has flower buds that open pink and fade to a grayish white haze that looks like smoke. In the autumn the leaves of this shrub will turn a stunning scarlet before they fall. In front of the Smoke Bush, the wise old owl looks down from his plinth where the large velvety blue petals of clematis Jackmanii twine gently around the base. 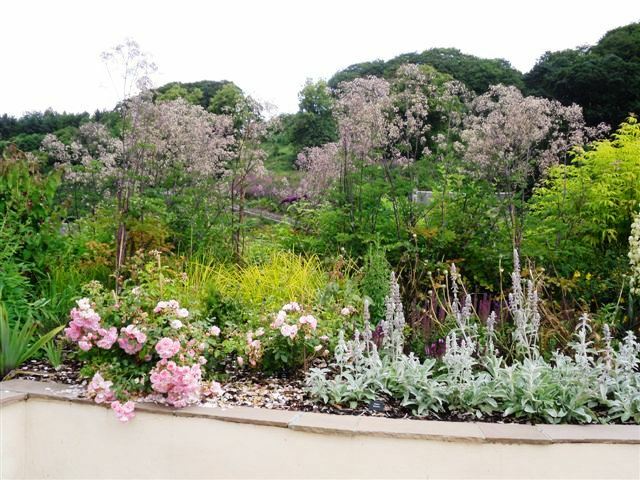 Flowers and fragrance are the highlights of July in New Lanark Roof Garden. The dramatic purple stems of meadow rue soar skywards supporting fluffy clusters of flowers that give the plant its name of ‘Thundercloud’. Bees buzz happily around the scented meadowsweet and lavender. Be warned though - the yellow, button-like flowers of santolina give off the smell of sweaty socks! On 3 June, between the showers, a Green-Veined White butterfly drank nectar from the purple flower heads of chives, showing off the dark green veining on the undersides of its wings. 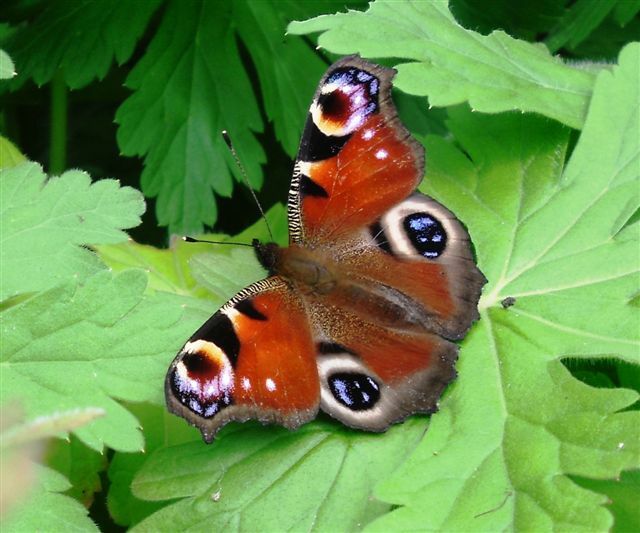 Gardeners, please note – this butterfly will not attack your cabbages, so please don’t kill it! It feeds on Lady’s Smock and likes humid places and damp meadows. In summer it flutters among the water forget-me-nots growing in the mill lade that runs through New Lanark village. This month in the Roof Garden, the star flowers are the geraniums! The highlight this month is the lovely shrub, Pieris ‘Wakehurst’. The red colouring is not caused by flowers but by the emerging leaves. These will fade to cream and then turn green as the season progresses. New Butterfly Bushes (Buddleia davidii ‘Harlequin’) have been planted in New Lanark Roof Garden and in the New Lanark War Memorial Garden. Late summer butterflies love buddleia flowers so we hope to see lots of both later in the year. The woolly willow is in flower with furry catkins covered in yellow pollen, and blackbirds and thrushes have been singing in the trees above the village. In the sunshine and smirry rain on the morning of 8 April, a rainbow appeared, arching over New Lanark Roof Garden. Beneath the strands of shimmering colour were tiny black specks that turned out to be buzzards gliding on the air currents away up high over the Clyde Valley. From the trees above the village came the dull rapping sound of a woodpecker drumming on a tree trunk. The natural world around New Lanark Roof Garden is always changing! 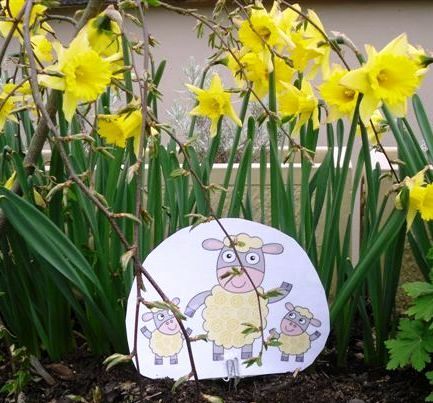 Come and enjoy our Easter weekend activities and find out if there is anyone hiding in the daffodils! It’s the month for mad March hares! The boxing hares sculpture by local artist, Laura Antebi, is a focal point at one end of New Lanark Roof Garden. The hares’ behaviour may look aggressive, but is in fact part of their courtship ritual that takes place in the spring. The poet, Andrew Young, catches the truth in “March Hares” where he describes seeing hares “Joyful in love’s full flood”. Don’t miss New Lanark’s Fab Family Sunday on 30th March – dress up in period costume and have your photograph taken! See Events page for more details. 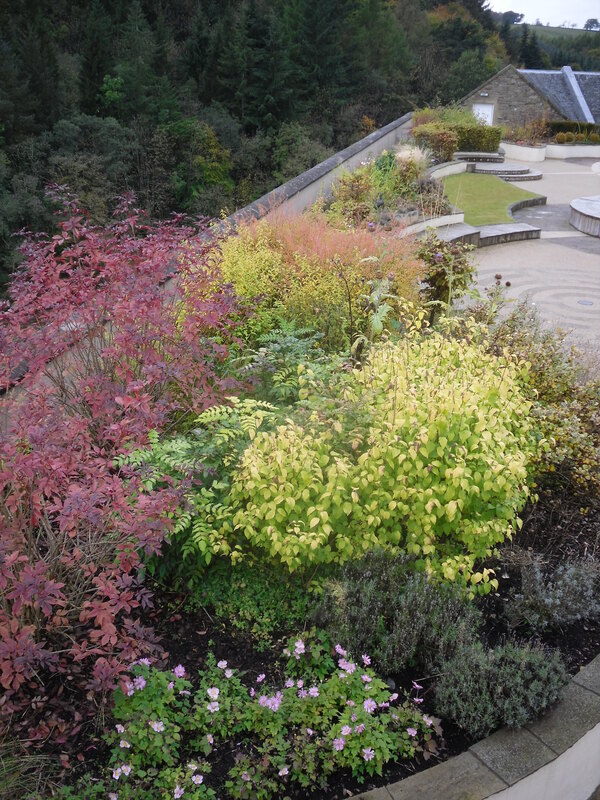 Thank goodness for the evergreens bringing a splash of living colour to New Lanark Roof Garden this month – aucuba, mahonia, box, yew, hebe and pieris. All are looking good in spite of their winter battering by wind and rain. Sparrows hide in the shelter of the yew’s dense foliage and come out now and again to forage in the flower beds. Snowdrops, the first sign of spring, are out now! Formerly known as Candlemas Bells because of their flowering time, they are like little quivering white bells under the hornbeam hedging. On 30 December, after storms and heavy rains, the swollen Clyde had completely swamped the Mid Inch, a small island in the middle of the river. Seven storeys below New Lanark Roof Garden, the river was roaring through the gorge, with tongues of dark water licking menacingly at New Lanark’s retaining walls. This time, however, we were luckier than many places and escaped being flooded. The Star Gazing event on 11 January was a great success and blessed with lovely clear skies. A record number of visitors turned up to enjoy viewing the planet Jupiter and its moons or the amazing craters on our own moon. Keep gazing! Jupiter is in the southern sky all month and Venus should be visible as a morning star before daybreak. Last winter seemed never-ending. 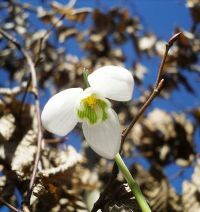 Everything in New Lanark Roof Garden was late and the snowdrops were still in flower on 25 March which is very unusual. However, by the end of April, the swallows were back and butterflies had appeared. In early May, a clutch of ducklings had to be rescued after hatching out in the shelter of the Roof Garden’s long grasses. By July what a difference! The shrubs that would normally flower earlier, e.g. Deutzia and Philadelphus, had caught up and were in bloom along with white campion, smoke tree, honeysuckle, lavender, thyme, heuchera and campanula - all flowering together in the fine summer weather. After that floral display, the autumn colours were magnificent and lasted until this month. Don’t forget our super Star-Gazing event on 11th January – see the Events page for details. Happy Christmas! “November’s sky is chill and drear / November’s leaf is red and sear” – These lines were written a few miles from New Lanark by Sir Walter Scott in the early nineteenth century. About the same time, New Lanark’s pioneering mill manager, Robert Owen, planted woodlands with paths on the hillside overlooking the village so that his workforce could enjoy fresh air in an attractive green setting. 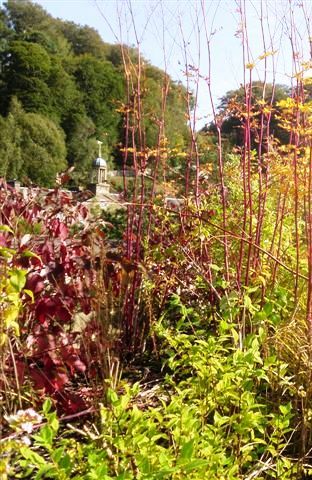 There is a good view of the mature trees from the modern New Lanark Roof Garden, and this autumn they have put on a brilliant display in billowing clouds of russet and gold. Also November’s sky is not always “drear”! So visit New Lanark Roof Garden this month for the stunning scenery and bracing air, as Robert Owen himself would recommend! 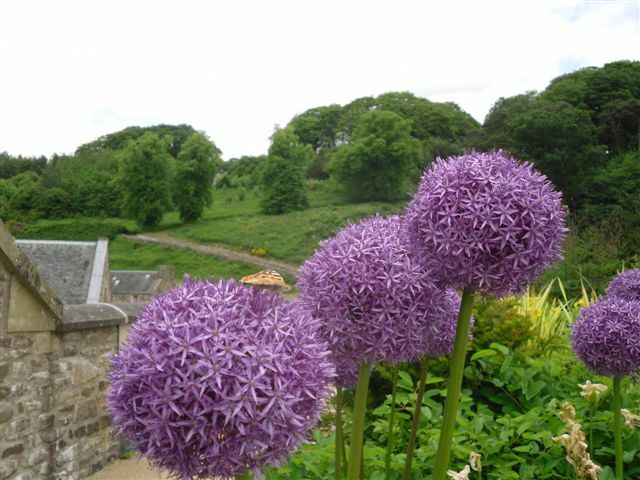 They were favourite flowers of the Victorians, and recently they have been the highlight of New Lanark Roof Garden. Penstemons, with their lovely tubular flowers, made a splash of crimson against a patchwork of softer colours. The variety here is a modern one, ‘Amelia Jayne’, bred by Edward Wilson, at his nursery in Worcestershire, and named after a friend of his family. As a child, Edward Wilson had fallen in love with penstemons after seeing them at Kew Gardens. He went on to become a famous plantsman and dedicated the final years of his life to creating new varieties of these beautiful flowers. As a result, ‘Amelia Jayne’ has brought a touch of old-style charm to New Lanark Roof Garden! In flower: penstemons, heather ‘Silver Knight’, anemone x hybrida ‘Honorine Jobert’, purple anemones, Russian sage ‘Blue Spire’. Now in a wonderful mellow phase, New Lanark Roof Garden is studded with late-flowering beauties, such as Japanese anemones and bright yellow Rudbeckia. 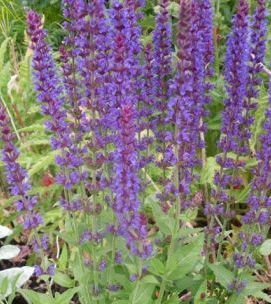 A haze of small blue flowers covers the wiry branching stems of Perovskia ‘Blue Spire’. Bees are still visiting the lavender and, in the sunshine on 4th September, a Peacock butterfly drank nectar from a Blazing Star flower (Liatris spicata) that looked like a purple torch. In flower this month: Blazing Star (Liatris spicata), Japanese anemone ‘Honorine Jobert’, Peruvian lilies (Alstroemeria), clematis ‘Jackmanii’, lavender, Perovskia ‘Blue Spire’, Buddleia, St John’s Wort, penstemons. 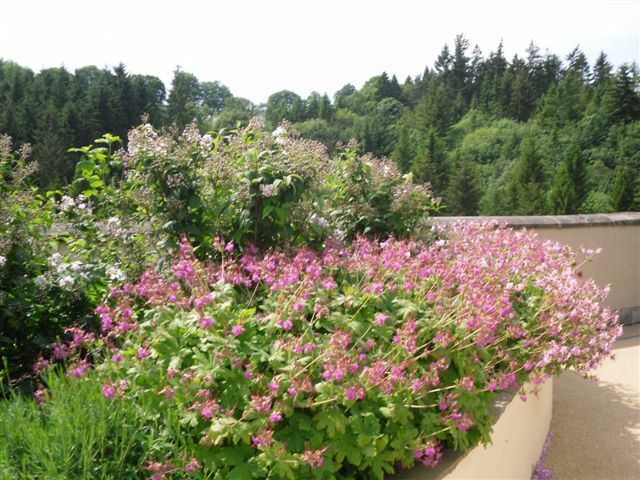 July brought long hot days, and everything in New Lanark Roof Garden seemed to come into flower at once! Thyme tumbled over the low walls, while the warmth brought out the scents of roses, honeysuckle and mock orange. Small Tortoiseshell butterflies fluttered around the spikes of blue lavender. On both sides of the garden, bright yellow flowers opened on St John’s Wort. In old Scotland, this shrub was known as St Columba’s Oxterful - oxter meaning ‘armpit’. The herb is said to have been placed under the armpits for use in healing. You can enjoy all this at the Summer Evening in the Roof Garden event on 18th August, from 5pm till 8pm. Admission: Adults £5, children £2.50, including craft activities and entertainment! In flower: Clematis, Lychnis coronaria ‘Alba’ (white campion), Lavender ‘Hidcote’, Meadow Rue, Philadelphus ‘Belle Etoile’ (Mock Orange), Rosa ‘Penelope’, St. John’s Wort, Santolina. Once again, a duck managed to lay eggs and brood its ducklings in New Lanark Roof Garden without anyone knowing they were there! Staff member, Scott Glover, said, “The Roof Garden is an ideal place for them. Last year there were only 4 or 5 ducklings, but this time there were about 10.” Unfortunately, they couldn’t get out of the Roof Garden and had to be rescued by New Lanark staff and the SSPCA who returned them to their natural habitat of the River Clyde. Scott is sure they will be back next year, however! Meanwhile the plants are catching up after the long cold snap. In flower this month: ‘Blushing Bride’ tulips, woolly willow catkins (Salix lanata), lilac (Syringa) and elder (Sambucus racemosa). This month in New Lanark Roof Garden we have “a host of golden daffodils”…. That’s how the poet William Wordsworth described the daffodils he and his sister Dorothy saw while walking near their home in the English Lake District. In 1822, while touring Scotland, the Wordsworths visited New Lanark. In her Journal, Dorothy mentioned the new educational methods she had seen being practised in Robert Owen’s School for Children. Dorothy’s writings also show that she had a keen interest in plants and a good knowledge of them. 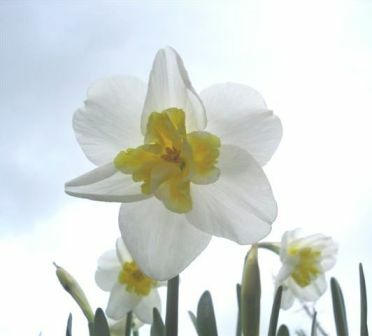 In flower: Narcissus ‘Lemon Beauty’, ‘Sempre Avanti’ and ‘Pueblo’. Also Muscari (grape hyacinths). Cheep … cheep … It’s me, the New Lanark Roof Garden robin! Did you know that April Fools Day was called Hunt-a-Gowk in Scotland? Isn’t “gowk” a great word for “fool”? I caught the snowdrops still here in their white cloaks on First April! Usually they’ve faded by then. So what happened to global warming? Was the Spring not supposed to start earlier? I’ve been chittering with cold and hiding from Jack Frost and the Snow Queen! But now the daffodils are out, and the box balls and Blonde Bob grasses have had a smart haircut. Oh! The peregrines are back at their nest site at the Falls of Clyde. Watch them on the new webcam in the Scottish Wildlife Trust Visitor Centre. You won’t find me anywhere near them though…. I’m not about to become a snack! March came in “like a lamb” - as old weather lore says, but then winter returned with a heavy snowfall. Still there are unmistakable signs of spring. The snowdrops are in bloom and the first daffodils have appeared. At the other end of the village, an otter has been seen frolicking in the River Clyde. In New Lanark Roof Garden you can see an otter sculpture where the artist has captured perfectly the animal’s alert watchful pose. In flower this month: Snowdrops, daffodils ‘Rynveld’s Early Sensation’ and Mahonia x media ‘Charity’. Stars, snow and a skein of wild geese flying overhead – these are some of the magical winter scenes in The Garden in the Sky! In late January, New Lanark Roof Garden was carpeted with snow and someone even managed to build a mini snowman! Candlemas Day (2nd February) was a fine day, but old weather lore warns: “If Candlemas Day be clear and fair, half o’ the winter’s to come and mair”. Will the old saying prove right? In spite of the weather, the snowdrops are coming into bloom at last. Stargazers: Jupiter remains the brightest night sky object for the next couple of months, so keep gazing, wherever you are. In 19th century Scotland, 5th January was known as Auld Yule, the last of the twelve days of Christmas. For many people, it was the only holiday they got! The ashes from the burned Yule log were scattered over the soil to condition it in preparation for the sowing of crops in spring. This month in New Lanark Roof Garden the promise of spring is shown in the boxing hares sculpture created by artist, Laura Antebi. The hares are made from recycled materials and look stunning against the evergreen yew hedge. 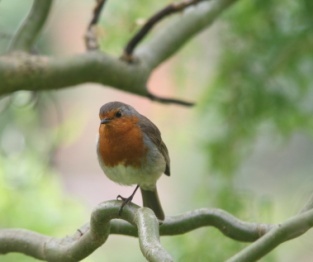 Cheep … cheep … chirrup … I’m the New Lanark Roof Garden robin! I bet you didn’t know that reindeer could fly? There I was, perched on a bare twig, with my feathers puffed out to keep myself warm. Jack Frost had already tiptoed across the Roof Garden and worked his magic on the fountain, changing the water into rock. Then, imagine my surprise when five tiny reindeer, made of sparkling light, came floating down from the sky and landed on the grass nearby! They said they were very tired as they had flown all the way from the North Pole. The Man Who Looks After the Reindeer will be at New Lanark every weekend and on Monday 24 December so you can visit him. Hey! Please put out some crumbs and fresh water for me and my friends this winter. I know you’ll be stuffing YOUR faces … Happy Christmas! At the beginning of November a late lone rose lingered, pale pink and fragrant, Rosa ‘Penelope’. Sparrows have been foraging for grubs in the flower beds to build themselves up for winter. Down below New Lanark Roof Garden, a grey heron was spotted stepping gracefully through the shallow eddies at the edge of the River Clyde beneath the autumn trees. Remember our Christmas Experience is on at weekends starting on 24th November – check here for details. For months now New Lanark Roof Garden has been drenched with rain and was “fair drookit”, as we would say in Scots! Yet it is still showing its autumnal purple and yellow hues. The River Clyde down below is running fast and high. The best way to see the Clyde at New Lanark is to climb up to the Roof Garden viewing platform. From there you can see the pattern the river makes as it curves through the gorge, past the midstream island called the Mid Inch. The trees all around are also glowing with seasonal colours. Remember – you can book now for our Christmas Experience! Check the website for details. In flower this month: purple anemones, Japanese anemones, Rudbeckia ‘Herbstsonne’, cardoon thistles. Summer is gradually slinking away but a whole new set of flowers has appeared at the start of autumn in New Lanark Roof Garden. Purple anemones are coming out, and there are beautiful Japanese anemones with clear white petals and orange centres. Dazzling yellow stars of coreopsis glow beneath the owl sculpture.The button-shaped flower heads of lavender cotton are fading fast, and smell like sweaty socks! On the other side of the garden, scores of hoverflies are attracted to the pale mauve spikes of heather ‘Silver Knight’. The swallows are still around but will soon be leaving for warmer climes as the temperature drops. In flower in September: purple anemone, Japanese anemone ‘Honorine Jobert’, Russian sage‘ Blue Spire’, coreopsis verticillata, heather (Calluna) ‘Silver Knight’, penstemon ‘Amelia Jane’, liatris spicata, rudbeckia ‘Herbstonne’, buddleia davidii ‘Harlequin’. The weather may have improved, but this August we have no flowering yucca and no butterflies in New Lanark Roof Garden! However, the lavender has braved the rain and the lovely bell-shaped flowers of penstemons add a touch of crimson. Meadowsweet, which also grows wild in watery meadows, has tall scented heads of fluffy white flowers, and the flowerheads of santolina shine out like yellow buttons. All these plants are attractive to the bees and hoverflies that appear whenever the weather is fine. The swallows are still around. Down below in the mill lade, small yellow monkey flowers are growing wild along with water mint and marsh forget-me-nots. The water-loving plants have had a great summer! In flower this month: Lavender, penstemon ‘Amelia Jane’, meadowsweet (Filipendula ulmaria), lavender cotton (Santolina chamaecyparissus), Philadelphus coronarius ‘Aureus’, clematis, Himalayan honeysuckle and various grasses. Either it has been raining heavily or a gentle misty smirr has enveloped New Lanark Roof Garden. In the constant wet conditions, the flowers have struggled, but the old cottage garden favourites have done best. In the troughs there are bright purple cushions of thyme beside spikes of blue lavender. The lovely pale pink rose ‘Penelope’ is covered in flowers with more buds to come and tall spires of foxgloves and meadow rue give soft colour and height to the garden. Even in the rain, the honeysuckle twining around the wooden owl’s plinth is sweet-scented. Also known as woodbine, honeysuckle appears in Shakespeare’s magical play,"A Midsummer Night's Dream" where it forms a canopy over the sleeping Fairy Queen! So bring your umbrella and enjoy! Click here for details of summer events. In flower : thyme, lavender, sage, astrantia, honeysuckle, lychnis coronaria Alba’, penstemon ‘Amelia Jane’, hebe ‘Midsummer Beauty’, rosa ‘Penelope’. The big purple spheres of the allium heads look stunning now, even when beaded with raindrops! They attract bees whenever the temperature rises. Chocolate-coloured leaves and tiny pink flowers adorn the black elderberry (Sambucus nigra) 'Guincho Purple'. The flowers have red stems and are borne in flattened heads called cymes. Contrasting with these purples and pinks are the showy yellow blooms of flag iris (Iris pseudacorus) and the lemon foliage of the sedge, Carex flagellifera. Honeysuckle twines around the owl sculpture, the flowers just opening to perfume the cool evening air. In May the pleasant spray upsprings / In May the mirthful mavis sings". These rhythmic lines from Alexander Scott’s joyful poem about May were written in Edinburgh in the 16th century, but could be describing New Lanark Roof Garden today! The hornbeam hedges are sporting fresh green leaves, the elder blossom is coming out, the woolly willow is covered in furry catkins and the tulips are blooming. From the surrounding countryside arise the notes of the mavis (song thrush) and other birdsong. The swallows are back, swooping low to catch insects in the valley. Also remember - our Midsummer on the Roof Garden Event takes place next month – click here for details. In flower in May - Kerria Japonica, tulips ‘Spring Green’ and ‘Blushing Bride’, elder, winter creeper (Euonymus) ‘Emerald Gaiety’, woolly willow (Salix lanata). Winter may be back, but the soaring temperatures in the last week of March brought the first bumblebee and a Small Tortoiseshell butterfly into New Lanark Roof Garden. Luckily there was a stray dandelion flower to provide much-needed nectar! The shrubs are now unfurling new leaves and there are hints of blossom beginning. In the case of Pieris, the emerging foliage is an eye-catching red colour. Throughout April, different varieties of daffodil will be in bloom, e.g. 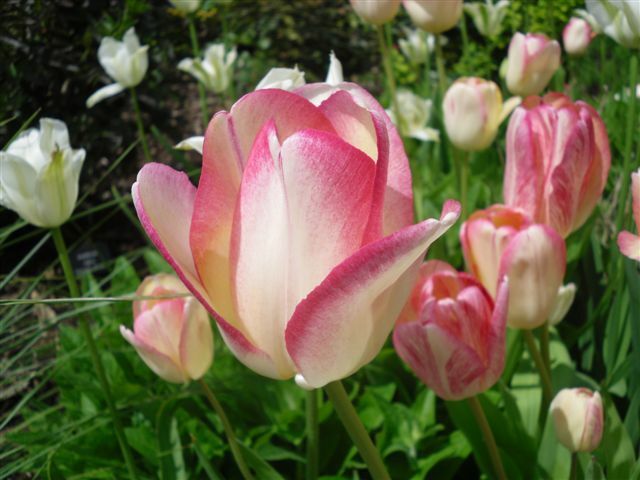 ‘Doctor Hugh’, with clear white petals and a rich orange cup in the centre. The lovely Narcissus ‘Lemon Beauty’ is scented and its central cup is split and streaked with yellow. 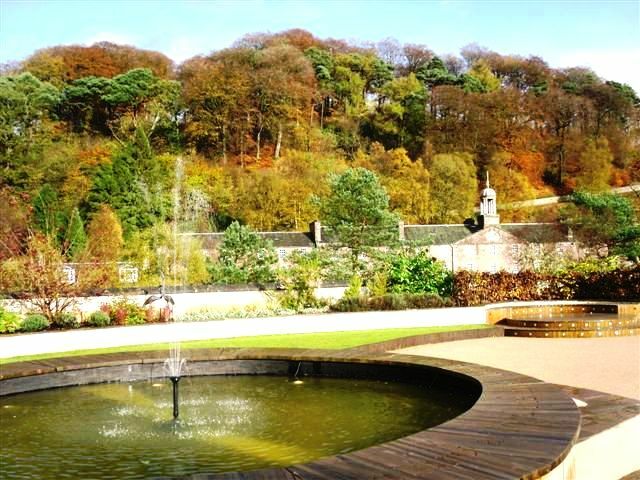 So, make a cheering Spring visit to New Lanark Roof Garden! Click here for details of all our events. In flower April 2012 – Kerria Japonica, Philadelphus coronarius ‘Aureus’ (Mock Orange), Daffodil varieties: ‘Lemon Beauty’, ‘Doctor Hugh’ and ‘Pueblo’. Spring-flowering bulbs are always a welcome sight after winter. The snowdrops are already fading, but February’s mild weather brought the first daffodils (Narcissus) slightly earlier than last year. The sturdy ‘Rynvelds Early Sensation’ glows with vibrant yellow trumpets surrounded by paler creamy yellow petals. Different varieties will appear in the weeks ahead. This is also the best time to see the animal and bird sculptures around New Lanark Roof Garden before the vegetation grows up and conceals them. Made by local artists from recycled materials, all the sculptures represent creatures that live in the surrounding countryside, e.g. frogs, otters, owls, crows, badgers and hares. Come and see who will be hiding in New Lanark Roof Garden at Easter! Click here for details of our spring activities. After the darkest days of winter, the first snowdrops are a welcome sight in New Lanark Roof Garden, quivering gently in the breeze beneath the hornbeam hedging. They usually last until March. The lovely evergreen, Mahonia x media ‘Charity’, has plenty of buds promising spikes of yellow flowers. As spring approaches, photosynthesis will gather pace. It is the miraculous process by which green plants weave sunlight together with water and carbon dioxide to make the carbohydrates and starches that form the basic food supply for all living things. Scientists still do not fully understand how it works. In the BBC 4 television programme, ‘Botany: a Blooming History’, Timothy Walker explained that scientists are trying to mimic photosynthesis in the lab, with the aim of creating new kinds of clean fuels. The plant world is truly amazing - so visit New Lanark Roof Garden and be inspired! In flower in February – Snowdrops (Galanthus nivalis). The Met Office has just reported that 2011 was Scotland’s wettest year on record, although the spring was warm and dry. Too much rain and the soil becomes water-logged, cold and claggy. For the Mediterranean herbs - rosemary, oregano and thyme – in the troughs, these conditions are not good, but the native Yellow Flag iris (near the hares sculpture) enjoys damp meadows. 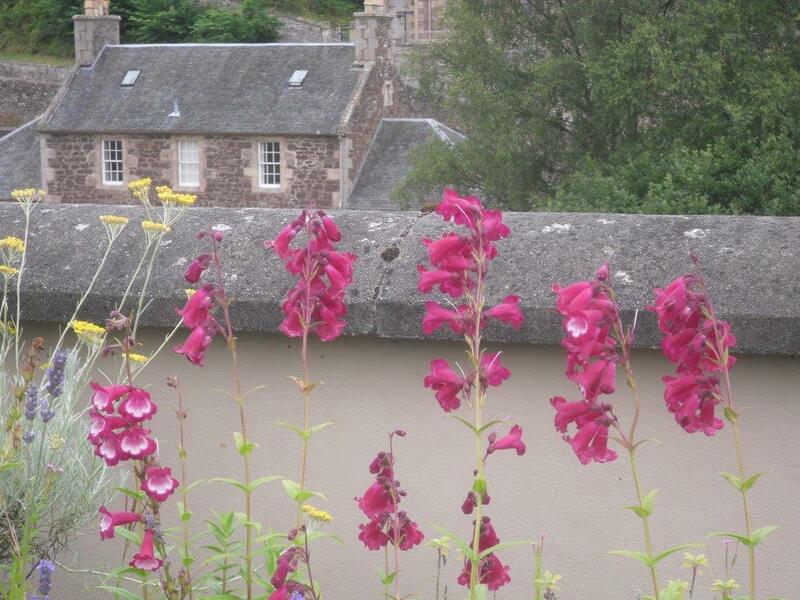 A new year begins in New Lanark Roof Garden and we look forward to the first flowers, the snowdrops, next month. The seasons follow the same annual cycle, but any gardener will tell you that no two years are exactly alike. New Lanark Roof Garden Diary will be recording what happens! Meanwhile, while the plants are dormant, we are hoping for clear skies for our Stargazing Live Event on 21 January. Come and discover the marvels of the night sky - click here for details. The robin is still around, feeding up to survive the winter and so that it will be fit to find a mate when Spring arrives. A magic spell has been cast over New Lanark Roof Garden this month! Some bright little reindeer have flown into the ‘Garden in the Sky’ and the roof garden elves have strung up tiny sparkling lights over the evergreen box balls and the yew hedging! The shortest day of the year, the winter solstice, is on 22 December, after which the light starts to return, imperceptibly at first. Eventually the increasing daylight and rising temperatures will stir the plant world back to life. Keep Saturday 21st January 2012 free in your diary for our Stargazing Live event on the Roof Garden, 5pm-7.30pm – click here for more information. Chase away the winter blues by spending some festive time with family and friends - try our fun-filled Christmas Experience – click here for details. Don’t forget to visit the roof garden reindeer! And - whatever faith or beliefs you hold, have a Happy Christmas! November chill blaws loud wi’ angry sugh ­-- Thus Robert Burns in 1785 described an autumn gale in his poem, The Cotter’s Saturday Night. In fact, November 2011 began with fine weather, but the effect of the wind is an important design consideration for any roof garden. The lovely Switch Grass (Panicum Virgatum) ‘Heavy Metal’, for example, was chosen for New Lanark Roof Garden because it can withstand windy conditions. Another strong plant, the stately Cardoon (Cynara cardunculus) flowered late with big, purple, thistle-like blooms. Related to the artichoke, cardoon was popular as a vegetable in Victorian times. Rudbeckia’s star-shaped daisy heads add a splash of bright yellow against the muted autumn colours. A robin has been foraging in the flowerbeds and singing his half-wistful song in the trees outside New Lanark Roof Garden. And from the valley comes the low growl of the River Clyde in spate. In flower in November - Japanese anemones, Rudbeckia ‘Herbstonne’, cardoon. The lovely Japanese anemones have stood up well to the weather and shimmer white against an autumnal background of reds, purples and gold. Red Grass (Imperata cylindrica ‘Rubra’) glows ruby in the sunshine and clumps of purple anemones are dotted around. New Lanark Roof Garden is now bursting with an amazing variety of seed pods. Waving like hair in the wind are the white seedheads of Feather Grass (Stipa tenuissima). Geranium seed cases look like tiny stork’s bills, while Clematis produces fluffy white seeds that disperse into the air like dandelion clocks. In the Visitor Centre this month - textile and Halloween crafts for young visitors - click here for details. In flower in October - Japanese anemone ‘Honorine Jobert’, penstemon ‘Amelia Jane’, liatris spicata, rudbeckia ‘Herbstonne’, purple anemones, astilbe, great burnet, heather ‘Silver Knight’. The latest stars of New Lanark Roof Garden were three young fledglings seen recently nestling on a ledge under the viewing platform. They were identified by the Scottish Wildlife Trust (SWT) as swallows because of the patch of russet colour on their throats. The parent birds have been flying around since May, swooping low over the garden and catching insects in mid-flight, but the nest was well-hidden! The young birds have now flown and, as autumn approaches, all the swallows will be leaving for their winter homes in Africa. Remember - you can now buy a joint ticket including entry to the SWT Falls of Clyde Visitor Centre for a small additional fee. Also, there are plenty of special events to enjoy at New Lanark this autumn - click here for details. In flower in September - coreopsis verticillata, penstemon 'Amelia Jane', liatris spicata, rudbeckia 'Herbstonne', Japanese anemone 'Honorine Jobert', purple anemones, smoke tree, heather 'Silver Knight', herbs and grasses. At the end of July, as expected, the lovely Yucca flaccida (‘Ivory’) came into flower– a tall stem bearing a cluster of large, bell-shaped, ivory-white flowers. Although Yucca is a native of the south eastern USA, it can tolerate different climates, and this specimen flourishes in New Lanark Roof Garden. 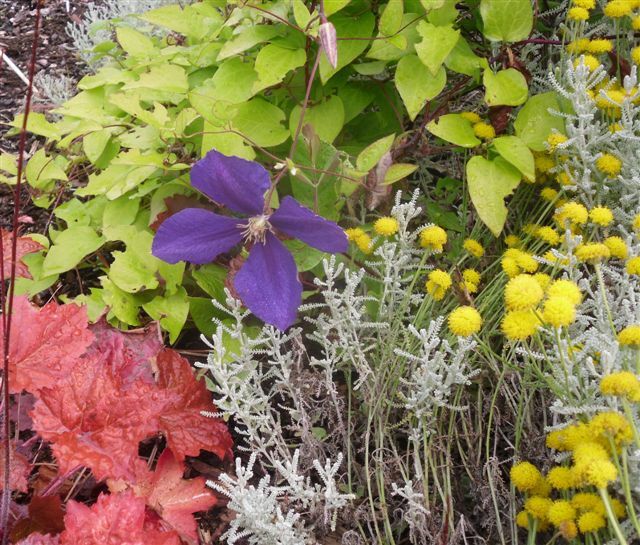 Beneath the owl sculpture, the deep blue of clematis and the rich red leaves of Heuchera micrantha (‘Palace Purple’) contrast with the bright yellow heads of lavender cotton (Santolina chamaecyparissus). Nearby Small Tortoiseshell butterflies flutter around the fragrant lavender. Children visiting with their families have enjoyed becoming nature detectives tackling New Lanark Roof Garden’s Creature Quest quiz – free with a Visitor Centre ticket! In flower in August - lavender, thyme, sage, clematis, agastache, Perovskia ‘Blue Spire’, white rose campion, meadowsweet (passing), lavender cotton, lamb’s ears, astrantia, globe thistle, Rudbeckia ‘Herbstonne’, St John’s Wort, white foxglove, buddleia, smoke tree, black elder, yucca. Warm days in New Lanark Roof Garden in July are just perfect as the fresh summery scents of meadowsweet, lavender and thyme, fill the air. Bees love the fluffy white flower heads of the meadowsweet (Filipendula ulmaria ‘Aurea’). A native of Europe, it was used in former times to flavour beer and mead (a fermented honey drink). 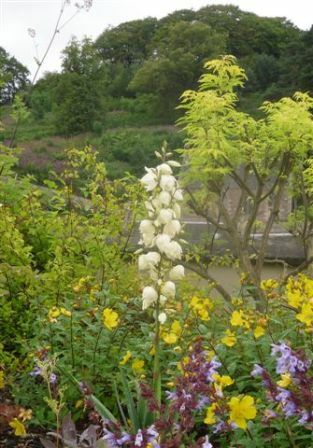 Also called Bridewort, it was made into garlands and strewn in churches at weddings, so newly-weds having their photos taken in New Lanark Roof Garden this July may feel inspired to include it in the pictures. Nearby is the yucca that should soon produce a tall spike of lovely creamy white flowers. It doesn’t flower every year so this will be your chance to see it. In flower in July – lavender, meadow rue, foxgloves (coming soon), santolina, white campion, smoke tree, sage, Perovskia ‘Blue Spire’, thyme, meadowsweet, elder, bears breeches, Philadelphus coronaria ‘Alba’, honeysuckle, yucca. A rainbow of colour appeared in New Lanark Roof Garden at the start of June, with vibrant red poppies (Papaver orientale ‘Allegro’) alongside the big purple heads of allium (Giant Onion) and the lovely yellow flag (Iris pseudacorus). The grasses produced delicate flower heads that swayed and rustled in the wind. Under the frothy white flowers of the Deutzia shrub, geraniums created a mound of purple colour. New herbs were planted in the troughs, including lemon balm, coriander, oregano and thyme. 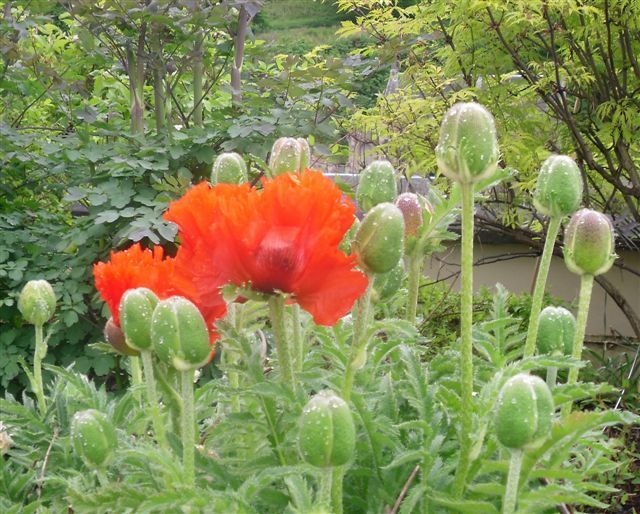 In flower in June – poppies, alliums, yellow flag iris, anemones, geraniums, Deutzia.